The Land Rover Defender, launched in 1948 was formally known as either a Land Rover 90 or Land Rover 110 and is one of those iconic British vehicles that has a place in many hearts around the globe (mine included), primarily as it is one of the true rough and ready off roaders that was never built or intended to be refined and a pleasure to drive, more so to do a job of crossing mountains, deserts, rivers and lugging cattle about, however over the years Land Rover have indeed refined the Defender to cope with modern lifestyles and make it a little more pleasurable and comfortable. 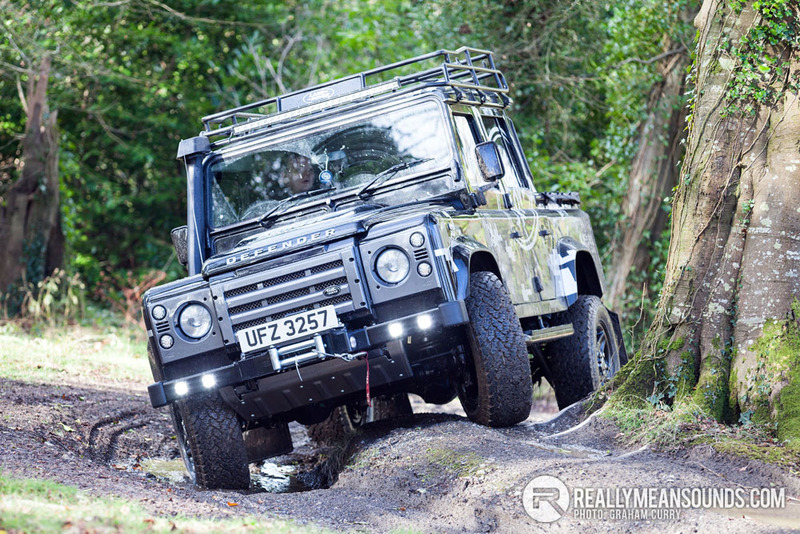 On road the Defender is still quite a cramped, noisy place to be with vague handling, however inside the latest high end models will see alloy wheels, heated leather seats, air conditioning, central locking and a CD player with BlueTooth and an aux input. There is also a host of approved accessories that you can buy from Land Rover dealers to spice up your Defender to fit your lifestyle and that of your pride and joy. This model tested from Charles Hurst Land Rover on the Boucher Road in Belfast has what can only be described as half of the parts catalogue added plus the rest, it has been ordered to show just how versatile and fresh the defender can become once some customisation takes place. For the off road lover this Defender has been treated to a set of wider wheels fitted with All Terrain tyres and a two inch lift on the suspension to cope with ground clearance and grip when in some serious off road situations, as well as a snorkel which came in very useful during our morning at the Ireland Off-Road Experience course within Clandeboye Estate and when things go wrong for you or your friends there is a huge winch added to the front of the Defender which is powerful enough to fell a tree never mind pulling you out of some mud. Off road there is very little available to buy with the ability and agility of a Defender and this is what makes it so hugely popular throughout the world for farmers, builders, off road enthusiasts and those into their country sports and towing heavy loads on a regular basis across terrain that most vehicles would stall at on first glance. With its 2.2 turbo diesel engine this model is a lot more refined than previous larger capacity engines and still packs a whopping 266lb/ft of torque which makes light work of towing up to 3.5 tonnes. For the adventurous city owner who will spend most of the time on the road rather than off it, this Defender has been specified with an LED light upgrade all round including DRL’s drilled into the front bumper and an incredibly bright LED light bar attached to the optional roof rack which would easily carry a couple of kayak’s whilst the double cab allows for you and three mates to head away to the mountains for a weekends adventure with enough room in the pick-up back end for your luggage, camping gear and a few bikes. Good write up and great shots, could have offered my 72 Series 3 if you wanted a few shots of an older model. Technically the model we know as the defender was launched in 1983 as the 90/110 and became officially know as the Defender in 1990. Pre 83 were only know as the Series models, although the current defender can trace its routes right back to the very start. Long runs the fox Nicky. And that's O/T. It seems the defender beards are coming out to have their say, which I think is great and what the blog is all about! Photos are great, better than the article imo Just being honest. | Photos are great, better than the article imo Just being honest. @Graham You nailed it, noisy, crap steering and uncomfortable Mine was a back breaker. 84596 a bit more room in this one with the seat extenders and the smaller momo steering wheel. thanks again @Graham for getting the defender out there so to speek!